Ground beef for tacos? Who needs it when you have tuna covered in a delicious dressing made from sour cream, freshly squeezed lime juice and the distinct flavors of Mexico (otherwise known as taco seasoning). Plus there's no cooking involved when using canned tuna! Now that's reason to celebrate! To commemorate this cook-free dish, I filled my kitchen with the celebratory songs of Jimmy Cliff and Kool and the Gang while preparing it. Jimmy's song "Reggae Night" had me feeling like I was on holiday stuffing my face with tacos. The Gang's "Celebration" didn't make me think of tacos but did bring back memories of dancing like a fool at wedding celebrations. But I digress. The length of the two songs was all the time it took to assemble this taco treat from the sea. Quick, easy and very tasty! Isn't that why we make tacos? To be honest, I wouldn't permanently replace beef tacos with ones made from tuna, but it does make for a nice change! In a medium bowl, whisk together sour cream, lime juice and seasoning mix. Stir in onions, cilantro and tuna. Season with salt and pepper. If possible, refrigerate for an hour to allow the flavors to meld. 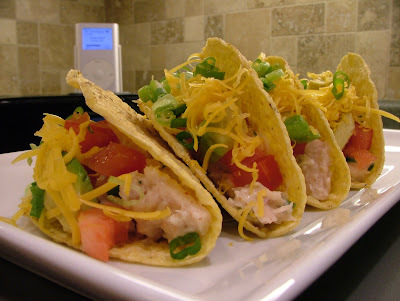 Fill tacos with tuna mixture and sprinkle on toppings.